The Blacksmith Snedbrir the Smith can repair your weapons and armor. The Healer Bronrod the Roarer offers sundries, potions and a good selection of Spells. Travel to the Skaal Village is restricted mainly to walking and swimming. The surrounding terrain is difficult and Blizzards often drop visibility to a few feet. Since there are no Tribunal Temples or Imperial Cult shrines in the region, the only magical transportation (or teleportation) is restricted to mark and recall spells. As there are no ports that have been built (mainly due to the weather), there is no travel by boat. Divine Intervention from here takes you to Fort Frostmoth, Almsivi Intervention to Gnisis. 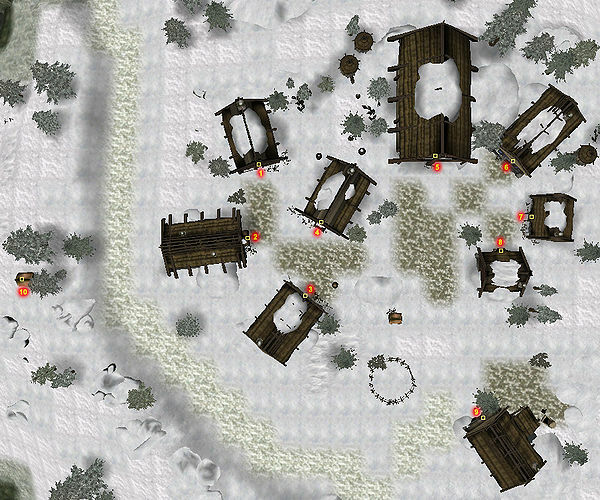 Skaal Village also appears in the Dragonborn expansion of Skyrim. The cave called Skygge can be found to the northwest, and Rimhull to the southwest is another cave with a surprising second exit. The Beast Stone lies due south, while Frossel, Sjobal and the Tombs of Skaalara are all found to the east.